Mike Schmitz takes a look at the strengths and weaknesses of Fab Melo with the help of Syracuse game film, head coach Jim Boeheim, and Melo himself. 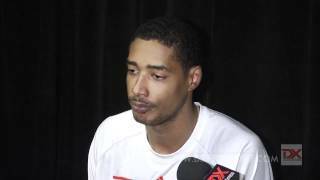 An interview with Syracuse's Fab Melo with footage from a workout he conducted in front of NBA teams in Los Angeles. Last time we checked in on Fab Melo we noted that it often takes centers longer to develop than prospects at other positions. The Brazilian center has been a prime example of that adage this season, taking an enormous step forward in a number of facets of the game for the second-ranked Orange as a sophomore after a largely undistinguished freshman campaign. The biggest factor in Melo's improvement this season has been his conditioning. Coming into the season in significantly better shape than he did as a freshman, Melo has been able to exploit his 7-foot frame more frequently thanks to improved quickness, leaping ability, and stamina. He still has plenty of room to add muscle to his frame and refine his physique, but he's taken the steps to put himself in position to succeed at the college level with his work this past offseason, a key reason he's playing 15 more minutes per-game as a sophomore. Melo's development as a byproduct of his improved physical tools has been most clear on the defensive end, where he's been the anchor of Syracuse's zone as he was expected to be as a recruit. Ranking 6th in the NCAA in blocks per-40 minutes pace adjusted, Melo's ability to step out to the high-post and rotate over to the weakside more quickly has allowed him to intimidate shooters with his 7'3 wingspan. Not only has Melo been a better shot blocker, but he's been a better defensive player across the board as a second-year player. Still losing contact with offensive players on the weakside leading to an occasional easy putback for the opposition, Melo is much more well-schooled at positioning himself on the defensive end than he was last year, doing a good job splitting the difference between offensive players when the ball gets driven into the paint, stepping in front of players attacking the rim to draw charges, and going straight up to challenge shots around the rim. Committing 2.6 fewer fouls per-40 minutes pace adjusted, Melo has shown dramatic improvement in the way he contests shots and protects the rim. Melo's ability to be active and physical has helped him on the glass as well. Though Syracuse still struggles on the defensive boards as a unit at times, Melo remains a capable area rebounder and has become a more significant factor on the offensive glass thanks to his improved motor. Lacking a natural feel for the game and usually being more focused on taking charges or chasing blocked shots in Syracuse's zone, Melo is not a very prolific defensive rebounder, though he does have soft hands and is improving his fundamentals. It will be interesting to see how much he can improve on this skill once outside of Syracuse's zone, as he simply isn't always in position to make a play here. Offensively, Melo remains a work in progress. His minutes may have expanded during his sophomore season, but his offensive role remained largely the same, with cuts and offensive rebounds comprising the majority of his touches according to Synergy Sports Technology. Often the fifth-option on the floor even as sophomore, Melo has continued to finish at an efficient 63% rate at the rim thanks to his size and length, showing good hands and finishing above the rim whenever possible. The young center has also improved his still questionable free throw percentage from 36% last year to 67% this year, though he remains limited as a shooter away from the rim. In one-on-one situations, Melo shows some interesting signs, though he still has a long way to go to be an effective post-up threat. Flashing solid touch on some of the hook shots and turnaround jump shots he attempts on his occasional back-to-the-basket touches, Melo lacks consistency down low. He makes some solid passes out of the paint, but still has some major lapses in his decision-making too, not showing great instincts on this end and looking especially mechanical when creating his own shot at times. With Syracuse's roster in flux as Scoop Jardine and Kris Joseph graduate, Melo could be due a significant increase in offensive usage as a junior, which would be a significant development in the trajectory of the big man's college career considering he's using under 11% of his team's possessions this season. Having a veritable break out year for one of the NCAA's best teams, Fab Melo has made significant strides on both ends of the floor that are clearly visible to NBA decision-makers, even if he is still raw in a number of facets of the game. Big men who can defend the rim are always at a premium, and Melo is starting to match his tremendous physical gifts with production on the floor, thanks in large part to his efforts to get into better shape. Melo's play in the tournament will be a key to Syracuse's success this postseason, and could give him a chance to play himself into the first round with a strong showing. Should he opt to stay in school, he'll be a focal point for the Orange as a junior in 2013 and could make a run at becoming a top-20 pick. Fab Melo's freshman year at Syracuse quickly became a telling revelation of where he stood in his learning curve. Considering his high ranking as a recruit, some were quick to call his season a disappointment, but for the purposes of his NBA potential, his struggles were a prime example of the old adage regarding how big men take longer to develop than any other group of prospects. Despite the lofty expectations some had for the young 7-footer, it became clear that patience would be a virtue when evaluating the former McDonald's All-American. Like so many young centers we've seen over the years, Melo spent the better part of the season on the bench. When he did see the floor, he appeared to struggle with the fundamentals of the game on both ends while showing little feel for the game. Furthermore, he had trouble using his physical tools to his advantage, largely looking as though he was just getting acclimated with his surroundings. Melo did string together a few solid performances as the Big East Tournament began, but even those glimpses into his skill-set were brief. Though he may not have had a terribly productive season, Melo did seem to develop some habits that may help him in the future. Entering last season out of shape, Melo's weight has been a concern on a number of different occasions since he emerged on our radar. A legit 7-footer, when Melo is in poor shape, his athleticism suffers, but when he trims down, he looks noticeably quicker, even if he isn't a dynamic athlete by any stretch. The Brazilian big man still needs to continue working on his strength in the weight room, but he appears to be starting this season in a much better place than he did last year in terms of conditioning, which is a promising sign. As far as his skill level is concerned, there is little we can add to what we've previously written about him at this point. Melo lacks much in the way of basic post skills and footwork, but still knocks down an occasional midrange shot, rolls in a right handed hook, or finishes the a lobs his teammates throw him when defenders play off him. Looking at Melo's small body of work in the post, he made a couple of nice step through moves last season, but would be well served to improve his jump hook, considering how valuable a tool that can be for a player his size at this level. Melo doesn't have a natural feel for making plays offensively, was never more than the fifth option when he was on the court, and had the ball simply stripped out of his hands quite regularly, but seemed to put things together on a few occasions as a post passer doing a fine job dishing the ball in traffic, usually to Rick Jackson. On the defensive end, Melo made his long-awaited debut as the anchor of Syracuse's zone, but struggled to make his presence felt for significant stretches. Still learning the nuances of the 2-3 and finding himself regularly out of position and in foul-trouble, his impact was limited on this end of the floor. When he wasn't in foul trouble, Melo blocked shots at a terrific rate, aggressively pursued rebounds, and remained active, but will need to improve his fundamentals, understanding of the 2-3, and discipline around the basket to stay on the floor and reach his exceptional defensive potential. With highly touted freshman Rakeem Christmas entering the fold for the Orange, this season will be an interesting one for Melo. He is already well ahead of where he was last year in terms of conditioning, but will face stiff competition for playing time. He has some off the court issues to address, including an upcoming court date for a domestic incident, but has the chance to take a big step forward on the floor. There's no questioning the young center's potential, or that he's a ways away from fulfilling it, but his ability to put things together and earn extra playing time in the short-term will be an important step in his development. Brazilian native Fab Melo looks to be in far better shape than he did the last time we saw him about nine months ago on the AAU circuit, shedding pretty much all of the baby fat he once sported, and moving a lot better in turn these days as well. His frame looks like it will easily be able to carry another 25-30 pounds of muscle as it continues to fill out through working in the weight room, which would make him a potentially superb prospect from a physical standpoint. Although he has all of the basic characteristics you look for in a highly intriguing big man prospect, Melo's skill-level remains largely underdeveloped. He struggled to operate effectively in the low post, showing average footwork and post moves with his back to the basket, not really possessing the knowledge of how to use his body effectively to carve out space and finish strong around the rim. He seemed to drift out towards the perimeter quite a bit in turn, showing a very intriguing stroke from mid-range, but also being fairly inconsistent with the actual results here as well. Understanding his limitations and learning how to play within a system will be key for him moving forward. All this shouldn't really come as a surprise considering the stage of development he's currently at. Big men in his mold tend to take time to develop, and he's only been in the States for about a year and a half on top of that. The good thing is that Melo knows how to make his presence felt, as he was a major rebounding force and showed much better defensively awareness than we had seen in the past. He blocked a number of shots in the actual game, showing terrific timing in the process, something that is extremely intriguing to say the least. He still has work to do in this area as well, as his fundamentals are fairly poor here as well, but the fact that he's making strides is encouraging. Melo's size, length, solid mobility soft hands and reportedly strong intangibles give him a terrific framework to build off, though, and should allow him to see immediate playing time for Syracuse in the Big East. Beyond that we'll just have to wait and see how quickly he develops, but there is certainly a lot to look forward to. This probably wasnt the ideal time, nor place, to evaluate Brazilian center Fabricio Melo (or Fab Melo, or Fabricio de Melo). After sitting out the entire high school season upon transferring to South Florida from his home country of Brazil, Melo (#5 Scout, #16 Rivals, #20 ESPN) looked out of shape and quickly became winded in every game we saw him play. On top of that, the AAU setting just isnt a great place to take in a big man of this nature, as the games are incredibly up-tempo, the referees blow the whistle any time anyone breathes on someone, and guards rarely look (or know how) to get the ball inside. Its safe to say that hes never (or rarely) competed in a setting like this before. Regardless, it isnt hard to see what the recruiting services like about Melo. A true 7-footer with an NBA caliber frame and a great wingspan, Melo has better size than pretty much any big man taken in this last years draft, outside of Hasheem Thabeet. His body is extremely loose at the momentit doesnt look like hes spent much time, if any, in the weight room, but with a good conditioning program, Melo could look like a stud in no time if he wanted to. Athletically, Melo is average at best by our standards. He runs the floor pretty well, but is definitely on the lumbering side, not showing great quickness and seemingly playing below the rim (although his length helps him tremendously as a finisher). He does have very agile feet, though, especially stepping out and covering ground surprisingly well on the pick and roll, and its tough to gauge how much his lack of athleticism is due to conditioning issues. He looks like hell be a major shot-blocking presence at the collegiate level regardless, thanks to his outstanding wingspan and impressive timing. Offensively, Melo was not productive at all in the games we took in, but still showed flashes of potential in many key areas. He seems to have very nice touch facing the basket, making a number of jumpers in warm-ups and even swishing a 3-pointer in an actual game. His low-post moves are raw and underdeveloped, but he did show some decent footwork from time to time, and definitely wasnt afraid to throw his body around in the low post. On the other hand, he struggled to make clean catches on a regular basis, looking somewhat uncoordinated at times, and blew a number of easy opportunities in the form of open layups and dunks. He clearly has a long ways to go on this end of the floor. Despite looking winded, Melo seemingly wants to play hard for the most part, and he also appears to be a pretty good teammate. He communicates regularly and definitely seems to care about whets going on on the court, which is always a good sign. Most indications weve received are that his work ethic is strong and he is an extremely high character person off the court. As far as first impressions go, this one wasnt the strongest, although we must take into account how highly most well-respected people who have seen him quite a bit more than us think of him. There are some question marks about how interesting these type of lumbering, old-school big men are for teams in todays NBA, but there is no doubt that well have to keep a close eye on Melo over the next few years. What's ironic is that we and many others saw Melo playing at the Adidas Nations camp one year ago and barely noticed his presence, as he was extremely out of shape at that point and almost a complete non-factor.